We're back this week discussing the latest and greatest in gay comic book news. Jason was brilliant and left his comics at work without reading them, but we're keepin' calm and carryin' on! We chat about the JSA (with all the Star people), Retro Wonder Woman, Daken: Dark Wolverine (and wtf is going on with Taskmaster? ), effed up JLA previews, annoying miscolorings (Wiccan and Sleeping Beauty... not in the same book... but we've already seen that Wiccan likes to play dress up), Generation Hope (and joins the Its Get Better bandwagon), and much much more! Ladeez Week! Karma and the ambiguously lesbian women of the DCU grace your local comic book store this week, and I'm looking forward to all three books! Karma is back on the team!!!! So it looks like that whole "New Team!" mumbo jumbo that the solicits were spouting at the beginning of this last storyline were just that: gibberish. The team hasn't changed, we just have an stationary unit and a mobile unit. Unsurprisingly, Karma is in the stationary set. 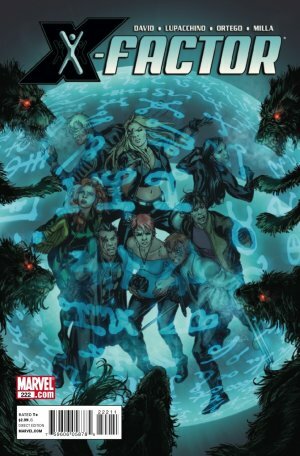 But that means that she's one of the five New Mutants featured this week! Woo!!! Also, Dani brings in a psychologist to help Nate deal with being a reasonable not-Gary-Stu. Sweet! It's the second to last Wonder Woman comic before the DCnU and this month we get New Wondy versus Classic Wondy (who we all know is Nemesis in disguise because we all read this book, riiiiight?)! Anyway, I'm excited for this storyline to resolve and usher in a new, awesome-r era of the Wonder Woman mythology. Hopefully we'll get some ability-to-alter-costume into the new power set/status quo. Because sometimes you want to wear star-spangled Spanx, and sometimes you don't! 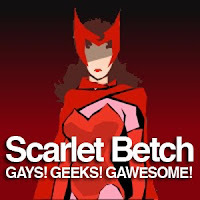 Scarlet Betch Comic Werkshop: Chapter 2! 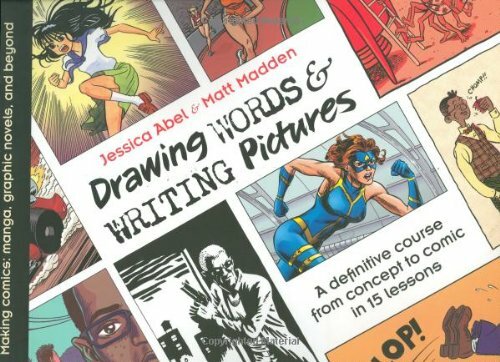 The subject of this week's weeerkshop is Chapter 2 of Jessica Abel and Matt Madden's Drawing Words and Writing Pictures: "Every Picture Tells a Story, But Only If It's A Gag!" Plus, my brother submitted some work for us to look at, Jason showers us with adoooorable Wiccan fanart, and the music theme is Club Tracks! We're back this week discussing the latest and greatest in gay comic book news: X-men Schism, House of Mystery, Legion of Superheroes (hooray Power Boy and Gravity Kid! DC has its own superhero boyfriends! ), Birds of Prey, Alpha Flight (Northstar saves the day! ), Batgirl (also known as The Grey Ghost is dead.... wait what?! ), Wonder Woman Pants controversy aka Pantsgate, the return of Ultimate X-men (and why we're excited about it... mainly because we're aching for some Ultimate Colossus gay beefcake and cuddles with crippled Ultimate Northstar). So many bi people this week! Okay, a lot of gays too, but we've got some bi representation from both sides of the gender aisle (those problematic areas within the larger, more inclusive gender church! [this metaphor broke so many syllables ago...])! Anyway, to the comics! It's salt house time!!! Last issue 'star and Rahne were running for their lives from an assortment of slash-y, bite-y animal gods while Layla was salting every entrance to XFI. This issue starts with everyone (except M and Strong Guy) rushing into XFI and shutting the doors. Unfortunately, we also learned last issue (or the one before...) that Pip the Troll is actually a Troll-spy, getting ready to put a plan of his own in motion! So, the score is outside: gnashing teeth and crackling god-power. Inside: traitorous trolls and a pregnancy coming to term. Given how crazy the last X-Factor birth was, get ready for fireworks! Donna's dead?!?!?! Hopefully not for long! The Eclipso story is wrapping up next month, so expect some eleventh hour acrobatics from Starman and Obsidian and a dreamy, power-awakening pseudo-death for Donna, as well as a trick or two from the man in the two-tone mask to raise the stakes for next month. This has been a really interesting cast of characters, so I hope they go out with a bang! Cassie's having dreams. About Beebs, about Gaga, and about the cast of Jersey Shore. Sometimes don't you wish they were just dead? Cassie does. And she's been killing them in her dreams. Funny thing: when she wakes up, they are! But what kind of Final Girl would Cassie Hack be if she just let these wish-fulfilling forces of evil go unchecked? It's saddling up time as Hack/Slash take on the Fame Monster! This story is ending! This issue is about Bill, says the solicit. And Sookie and Jessica too, but mostly Bill. Yawn... I haven't been picking up this TB series, so don't know if we can expect some Lafayette, but it's the last issue, so if you have been reading along, this is the big finale! Herc loses his shirt for a scene! Justice! Also, he's teaming up with his mystical foes to go take down a bunch of run-away gods who are riding high on the tide that is Fear Itself. So, cool times. Herc smash! This seems like it could be the coolest thing! If you don't know, before the big re-launch DC is doing a limited series of three issues each for its long-running heavy-hitters, one for the '70s, one for the '80s, and one for the '90s! The issue will be written by an iconic writer from that era and work to capture the spirit of the decade. This week it's the '70s, which means Wondy is in white and... really I don't know anything about this era, which is why I'm gonna #buyit and find out! Are there any other queer characters with their own on-going solo title? Even though he's another villainous queer, Daken is the most interesting superqueero around these days, and Rob Williams' run on this title isn't changing that any time soon. This issue sees the escalation of the plots introduced last issue: Daken gets nasty with his new closeted beau/tool, the serial killer gets stabbier, and the cop on the cover gets wrapped further in a web between the two of them. I've read that Victoria is getting a little antsy playing the good guy and is double-agenting between the Avengers and the remains of H.A.M.M.E.R. The solicit for this issue says that the New Avengers and the Avengers are teaming up to deal with Fear Itself, though, so I'm not sure how Hand's double-dealing would feature in this issue. Either she's front and center, making some under-the-table meetings that will screw with her teammates, or she's sidelined this issue. Only one way to find out: flip through it in your comic book store and buy it if you see pink highlights! It's the first ep of our journey working through Jessica Abel and Matt Madden's Drawing Words and Writing Pictures! I split our discussion into three parts: discussing chapter 1, discussing the "classwork" we did, and discussing our homework assignments. The first part is posted below and parts two and three are embedded after the jump! The solicit for this issue is promising to reveal a lot of secrets, so I'm tagging it "awesome" in terms of twisty-plot reveals and "low-moderate" in terms of likelihood of finding out what Tursig's been up to. I'm gettin' it though! We are back at it again... IN THE SAME PLACE! We chat about the latest in Avengers: Children's Crusade (aka Wiccan has mommy issues), Wonder Woman (not actually the end, j/k! Solicits lie! ), Glee, Doctor Who and much much more! Did we mention that we're in the same place? Holy Uncommon Occurrences, Batman! We continue our first week with crossposting on Gay-Nerds.com. We totes forgot to introduce ourselves, so consider this our 0.1 issue, which can help you catch up! We chat about Daken Dark Wolverine (and his continued queerness), Batgirl (the last of the Steph Brown issues, plus Squire! Brits! ), Alpha Flight (hooray Canadians! Queer Quebecois! Kyle's adorable! ), X-Factor, Generation Hope (finally gets interesting! ), and much much more!